Scoliosis is a medical condition in which the spine has a sideways curve. Usually, this curve is ‘C’- or ‘S’ shaped. In some people the curve degree is stable, while in other patients it can increase over time. Typically, mild scoliosis doesn’t cause problems, but a severe case can interfere with your breathing. The cause is unknown in most cases, but it’s believed to involve a mixture of environmental and genetic factors. Risk factors of this condition include other family members who are affected. It can also occur as a result of another condition like Marfan syndrome, cerebral palsy, muscles spasms and tumours like neurofibromatosis. 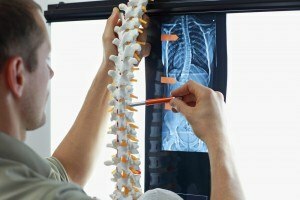 Can your chiropractor fix scoliosis? It is essential to understand from the start that this medical condition is treatable. However, it is not technically ‘curable’. At times, the condition is compared to diabetes because it is a condition that needs ongoing care. It is important for patients to reframe their thinking to the long term, not the short term. This is an ongoing condition that you can be managing for your entire life. Keeping that in mind though that you can live an amazing life with fewer limitations if you just find the right approach of managing your scoliosis. Provided you stay committed to the plan that you develop with your chiropractor, you can significantly improve the QOL (quality of your life), and avoid surgery or bracing. Diagnosis is often confirmed with X-rays. The condition is classified as either functional, in which your underlying spine is normal, or structural, in which your curve is fixed. Not all chiropractors are equipped to effectively diagnose issues that are related to scoliosis. Consequently, it is easy for the underlying root causes and related issues like the surrounding ligaments instability to be missed. Effective diagnosis is very important when it comes to developing a treatment plan that is right for you with great results. Be sure to look for a chiropractor who can effectively diagnose scoliosis. Normally, chiropractors look for any ‘stuck’ joints in the patient’s spine and make them ‘unstuck’. However, when it comes to scoliosis, joint mobility is not a major issue. It is the joint location that is off. Treating this condition using a traditional chiropractic approach may put more pressure on your spinal joints, aggravate those surrounding nerves and result in scoliosis becoming worse over time. First and foremost the joints of your spine should be repositioned. But for long term benefits to occur there is a lot more that has to accompany the repositioning. Your muscles should be relaxed, and your brain should be retrained to use spinal joints and muscles differently than it has become accustomed to. All these things should happen together for this condition to be effectively treated. In practice, this often means scoliosis massages, stretches, and exercises together with scoliosis-specific adjustments. You chiropractor will look for how rigid your spine is. This will give them an indication of exactly how much work needs to be done before your chiropractor can effectively begin repositioning the spine. SMI (Sensorimotor integration) refers to how well the brain can communicate with the body. Miscommunication between your brain and body can result in many issues; for instance, scoliosis. Fixing scoliosis needs your chiropractor to retrain your brain to use your body, especially your spine, in ways it has grown unaccustomed to.